Two Accor-Ambassador sister hotels in Seoul, Sofitel Ambassador Seoul and Novotel Ambassador Gangnam invite autumn diners to a special food promotion "Vietnamese Food Festival." Sponsored by the Vietnam Airlines, the special food festival will be held from August 29 to September 24, for two weeks at each hotel with various traditional Vietnamese dishes prepared by the special guest chefs from Sofitel Plaza Saigon, another Accor brand hotel in Vietnam. Vietnamese cuisine, a mixture of "spectacular" French and "diverse" Chinese cuisine style, is known for its low-fat recipes and quickly grabbed the eyes of Korean gourmets to become the hottest foreign cuisine introduced in Korea. The rice noodles and spring rolls are two of the most popular names in the menu with its dietary recipes with sprouts, onions and peppers. During the festival, the two special guest chefs from Sofitel Plaza Saigon will display a fine selection of authentic Vietnamese delicacies including Vietnamese salad, cold food, warm food, fish and meat, rice and noodles, which will be served as buffet style. 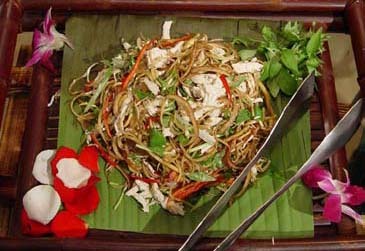 Also available menu is the quick rice noodles with fresh vegetables. With the Vietnamese style interior and service by the staff in Vietnamese traditional attire, the Vietnamese food festival is available at Cafe de Chef at Sofitel Ambassador Seoul and the bistro at Novotel Ambassador Gangnam for two weeks each at the price of 35,000won and 40,000won for lunch and dinner respectively. The special Vietnamese food promotion will kick off with an opening gala dinner on the beginning day, August 29 with VIPs including the Vietnamese ambassador to Korea, Mr. Pham Tien Van and the regional director of Vietnam Airlines. Also during the festival, there will be a lucky draw event for guests for a chance to win a free stay at Sofitel Plaza Saigon.